Kish Island, Iran, February 18, 2016 – Oleg Stoyanovskiy and Artem Yarzutkin pulled off the shock of the Kish Island Open so far when they knocked out top seeds Markus Böckermann and Lars Flüggen at the quarterfinal stage on Thursday. The Russian pair reached their first semifinal by beating the German duo, the winners of the most recent FIVB World Tour tournament in Qatar, 2-1 (18-21, 23-21, 15-13). It sets up a semifinal against Poland’s Michal Kadziola and Jakub Szalankiewicz who defeated their compatriots Maciej Kosiak and Maciej Rudol 2-0 (21-18, 21-18). The other semifinal will be between Qatar’s Jefferson Santos and Cherif Younousse and a second Polish team in former U19, U21 and U23 World Champions Piotr Losiak and Bartosz Kantor. The 19-year-olds are embarking on their third year on the World Tour and have played all but one tournament as a pair, including the 2014 U19 and U21 World Championships. Despite their lack of experience, they held their nerve and played some top-class beach volleyball to knock out a pair who won two gold and two silver in 2015. 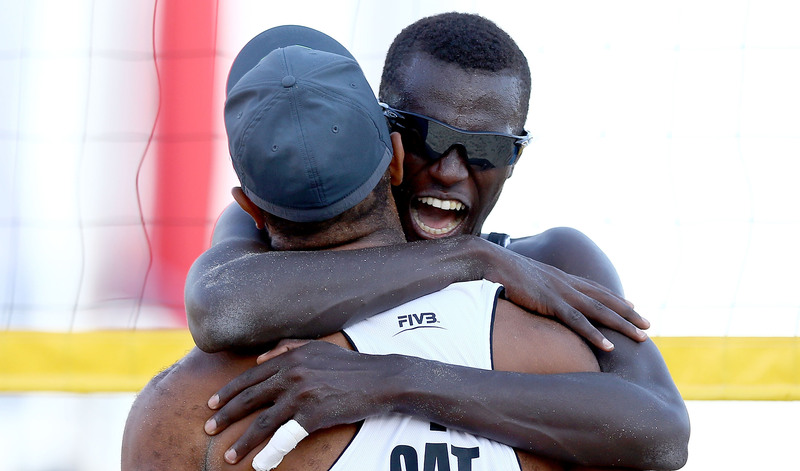 Jefferson and Cherif are also into a World Tour semifinals for the first time after they defeated Mexico’s Lombardo Ontiveros and Juan Virgen 2-0 (21-15, 21-19). The pair quickly grabbed control of the match and didn’t let go despite the Mexican duo’s best efforts. The result eclipses their quarterfinal finish from the Netherlands 2015, FIVB Beach Volleyball World Championships, the Qatari pair’s previous best finish. “They are a good team and we were in the same pool,” Cherif said. “They have a good serve, but we raised our aggression and we did the same as we did in the pool match and that got us through. The Kish Island event is the first of the 11 Open tournaments to be staged by the FIVB in 2016, following on from Open events in Puerto Vallarta, Antalya and Doha in October and November last year, which heralded the start of the 2015-16 season. Qatar will host a second Open event in Doha from April 4 to 8.